The EnviroLeader program is available to Sonoma Valley teens between the ages of 14 to 18 and offers hands-on education in the fields of sustainable agriculture and restoration. The EnviroLeader program provides Sonoma Valley teens with the opportunity to gain essential job and life skills through practical environmentally focused training. There will be an emphasis on sustainable agriculture, community building and park stewardship over the summer months. 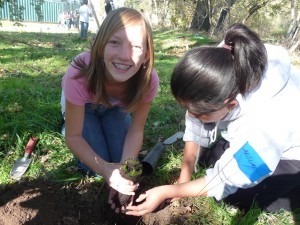 EnviroLeaders are mentored by Sonoma Ecology Center educators and other professionals in the environmental field. They meet twice a week, at the Sonoma Garden Park and other sites around the Valley. We’re looking for students who are good team players, have strong communication skills, are willing to learn and have an interest in working on sustainable communities and climate change. Bilingual students are encouraged to apply! Contact Tony Passantino at 707-996-0712 x124 or tony@sonomaecologycenter.org. To register, click on the button below and submit your application along with a resume and cover letter.